Stan has recently been advising and working with the handlers and dogs that sniff out different types of explosives at Heathrow Airport. These are called (RASCO or REST dogs). They Help to keep the UK safe from terrorist attacks. 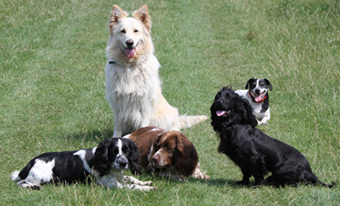 Stan has written for many Dog Magazines and Daily Newspapers on all aspects of Dog Behaviour and Training. Recently starred in a number of episodes of "A Different Breed" - an eight part series aired at prime time on Sky1 HD - and has appeared on television on numerous occasions as a canine expert and dog behaviourist. Often giving specialist information regarding Dog Aggression and Canine Body Language and dog communication. Stan gives lectures and talks for clubs, show, seminars and regularly gives demonstrations at large shows such as East of England Showground and other shows all round the country. He is probably the only dog behaviourist that takes dogs out the audience that he has never worked with or met before. Then works on their problems in front of a live audience. Stopping many of the problems and behaviours in minutes. W run puppy classes held in Hampton, Middlesex. See news and views on the right for further details. And is the designer and developer of "The Jingler" and amazing new training aid that puts you firmly back in charge of your dog. My clients include Royalty, Billionaires, Rock Stars, TV & Film Stars, Football and Rugby players. A lot of his work is done in the London area. However he also covers. Middlesex. Surrey, Essex, Berkshire, Kent, Sussex, and Hampshire. Though he is prepared to travel further if required. He owns 5 dogs which are shown here. They are from left to right. Guinness (Working Cocker) Kai (White German Shepherd) Edward (English Springer Spaniel) Jet (Working Cocker) Charlie (Jack Russell x Dachshund). Three of his dogs work as Gun Dogs. But all of them work in his practice interacting with other dogs who may be aggressive, fearful, or in need of other types of canine contact. See Philosophy for information on how he work and why he is so effective 99% of all my clients only ever need to see me once. 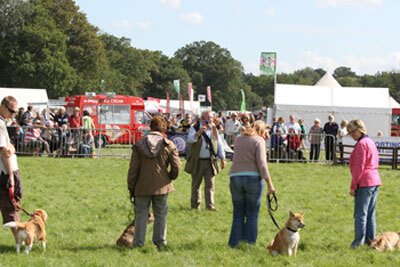 Stan at the Cranleigh showground on Sunday 7th August 2011 with people he has taken out of the audience. of the crowd to show how effective his methods are. Many people are amazed at his skills and how quickly he can change a dogs behaviour. 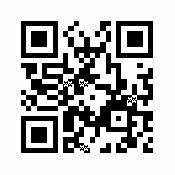 If you have a smart phone with a QR Reader (They Are Free) Then hover with your camera in your reader over the image on the left, it will take all my details including email website & phone numbers and address and put it into your phones contact list without you having to type one letter. Before you make any decision about contacting me please check on my ranking in Google. This confirms why I am considered to be one of the UK's leading canine experts in Dog Behaviour and Training.